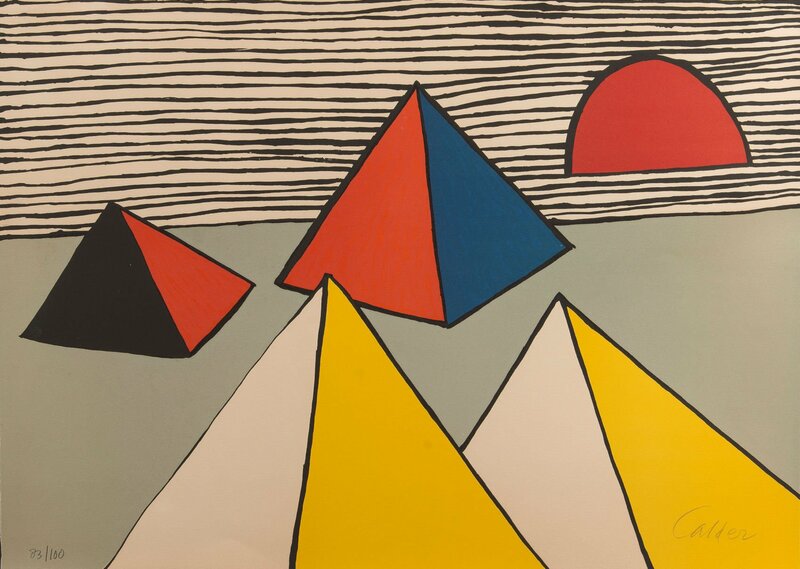 This striking lithograph by Alexander Calder depicts the Great Pyramids of Giza just outside of Cairo, the vibrant red sun rising in the distance. The pyramids and their surroundings were a theme Calder returned to time and time again. The pared-down palette satisfied the artist’s taste for contrast. Here Calder has used a limited palette of red, white, blue, black and yellow to depict them. Calder wrote “I have chiefly limited myself to the use of black and white as being the most disparate colours. Red is the colour most opposed to both of these— and then, finally, the other primaries. The secondary colours and intermediate shades serve only to confuse and muddle the distinctness and clarity.” His limited colour palette has created a graphic take on a well-known location.